Events like the 2014 Winter Olympics and the 2018 World Cup are supposed to provide an impetus to improve infrastructure and the economy and encourage tourism in Russia's troubled North Caucasus, but terrorism remains a major concern. Three tourists from Moscow were killed in the North Caucasus Republic of Kabardino-Balkaria on Feb. 18. A ski lift was attacked with explosives and three car bombs defused, as insurgents turn up the heat on Russia's plans to bring tourism investment to the region. The news also rings alarm bells ahead of the Sochi Winter Olympics, set to be held close to the region in 2014. Regional police spokesman Maxim Ushanov told AFP that the tourists were attacked on the night of Friday, Feb. 18, as a minivan was transferring them from a regional airport to the winter sports resort of Baksan. The vehicle was stopped by men in camouflage and masks who said they were security officers. The men demanded the tourists leave the vehicle and opened fire when they refused. A fourth tourist is reported to have died in hospital over the weekend, although police refuse to confirm the news. 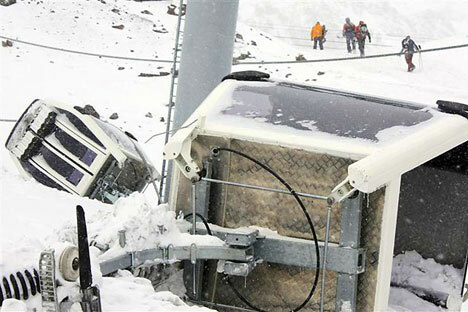 Meanwhile, the same evening a cable-car on Europe's highest peak, Mount Elbrus, was hit by an explosion. Local police reported there were no injuries, RIA Novosti reported. However, the campaign continued into Saturday, when police defused three car bombs rigged with a total of 70kg of TNT. The three vehicles were parked close to hotels around Mount Elbrus, a popular ski destination. "The law-enforcement bodies of Kabardino-Balkaria have prevented a large-scale terrorist act," a police spokesman said. The authorities announced on Sunday that a counter terrorism regime had been established in the area. "The headquarters ... has decided to impose a counter-terrorism regime from 10:00 a.m. Moscow time on Sunday in the Elbrus area and part of the Baksan district to prevent subversive and terrorist acts that may cause the death of people ... and to look for members of illegal armed formations complicit in carrying out terrorist attacks in the republic." Last month's devastating bomb at Moscow's Domededovo Airport, which killed 36, was a potent reminder of the continued strife in the North Caucasus, where attacks on what are often corrupt and cruel authorities and police are a daily occurrence. The move against the region's tourist infrastructure is a direct blow against a pillar in Moscow's strategy to calm the situation. Following the bombing of the Moscow metro in March 2010, alongside the usual calls for swift and bloody retribution, President Dmitry Medvedev opened discussion over improving the hopeless economics of the area. To that end, the Kremlin has announced it intends to turn the strife-ridden region into a major tourism hub. Last month, a $15 billion plan to build five major ski resorts was reiterated. The attacks over the weekend are evidently meant as a clear warning to any investors that might have been thinking about sinking cash into the scheme to think again. The president of the republic picked up this theme when speaking with reporters on Saturday. "This is not just an atrocious crime," said Arsen Kanokov, "this is a kick in the teeth to all the people of Kabardino-Balkaria, who consider hospitality as a cornerstone of their culture and lifestyle."